GeoVision’s License Plate Recognition is an effective and low-maintenance solution to ensure the security of parking lots, which are prone to crimes due to isolated and unstaffed corners. In addition to providing high-resolution video monitoring and recording, the LPR solution detects and recognizes vehicle license plates upon motion or I/O trigger. 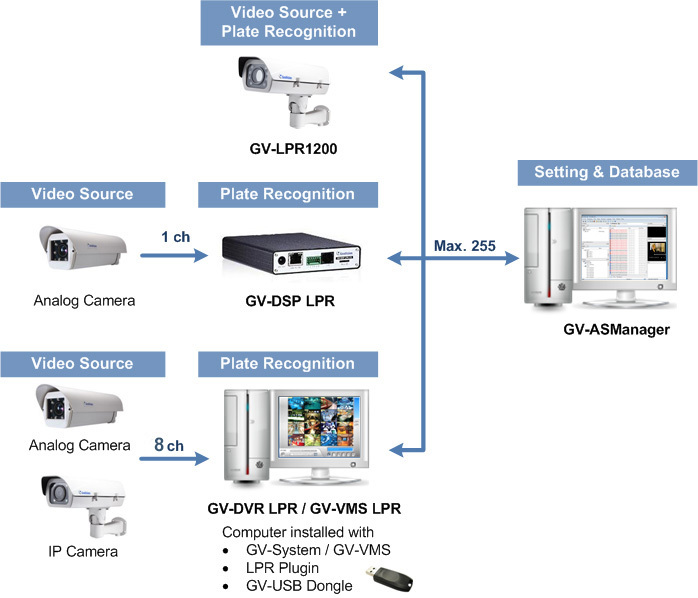 A GV-LPR1200, GV-DSP LPR, GV-DVR LPR or GV-VMS LPR recognizes license plates detected in the video source, and sends the LPR results to GV-ASManager. 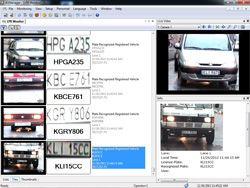 Access can be granted when the detected license plate numbers match the vehicle registered in GV-ASManager’s database. Alarm notifications and playing back LPR results are also supported. There is a Global version which is suitable for most of the other countries. More are to be implemented. 1.It is recommended to use separate PCs for GV-AS Manager and GV-DVR. 2. If no LPR dongle is inserted, license plates will be captured but the plate numbers will not be recognized. 1. It is recommended to use separate PCs for GV-ASManager and GV-VMS LPR. Note: If no LPR dongle is inserted, license plates will be captured but the plate numbers will not be recognized. GV-ASManager V4.1 is only compatible with GV-DSP LPR firmware V2.0 and V2.0.1. GV-ASManager V4.2 is only compatible with GV-DSP LPR firmware V2.0.2. GV-ASManager V4.2.1 – V4.2.2 is only compatible with GV-DSP LPR firmware V2.0.3. GV-ASManager V4.3 – 4.3.5 is only compatible with GV-DSP LPR firmware V2.10 and GV-LPR1200 V1.01. GV-IO Box The GV-IO Box provides 4, 8 or 16 inputs and relay outputs. It supports both DC and AC output voltages, and provides a USB port for PC connection. GV-LPC1100 THe GV-LPC1100 is a 1.3MP B/W network camera designed for recognition of reflective license plates on vehicles traveling at 120km/hr (75 mph) or less. GV-LPC1200 GV-LPC1200 is a 1 MP B/W network camera designed for recognition of reflective license plates on vehicles traveling at 200 km/h (124.27 mph) or less. GV-LPR Cam 10A ANPR Camera The GV-LPR CAM 10A provides 570 TVL high-contrast license plate recognition video to GV-DVR LPR or GV-DSP LPR that identifies license plates. The camera features 7 high-efficient LEDs for an illumination range of 7 ~ 12 m (22.96 ~ 39.37 ft). GV-LPR Cam 20A ANPR Camera The GV-LPR CAM 20A provides 570 TVL high-contrast license plate recognition video to GV-DVR LPR or GV-DSP LPR that identifies license plates. The camera features 24 high-efficient LEDs for an illumination range of 15 ~ 25 m (49.21 ~ 82.02 ft).